On Sunday, Nanny passed out in church and was taken to the hospital in an ambulance. Monday through Thursday, I've been dealing with Hurricane Ethan with gusts up to Mommy-I-Hate-You miles per hour. For instance, this morning he tried to lock me in the bathroom, just because. Are you guys aware of the solar storms flaring up in anticipation of the 2012 height of the 11-year solar weather cycle? I know what you're thinking: Who isn't? Japanese studies have shown (←watch how I don't cite them specifically, because I can't find them, but I did read about this in my Mom's All You magazine) that solar weather this month can cause irritability and heightened stress levels in human behavior. If my house were the test lab, the hypothesis would be confirmed. I'm a big proponent of blaming outside forces for things that go wrong. And now, science agrees! So today I drove Ethan to my mom's house because 1) He didn't want me to change his poo diaper (Hey, kid, no skin off my Ashtabula! ), and 2) His plan B (have Noah drive home from work to change his diaper) wasn't happening, so he opted for plan C: make Nana do it. At least, according to my interpretation of the situation, I couldn't get through. But the superintendent of the building crew (who we'll call Crazy Woman) decided I had plenty of room to get through, which conveniently meant she didn't have to move her truck. 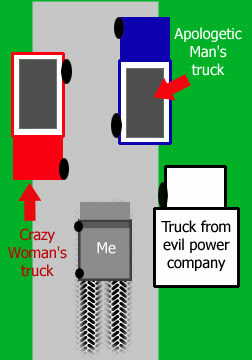 The man she was talking with, to whom the other truck belonged, looked noticeably agitated and equally devoid of the stones to contradict Crazy Woman. See the tire tracks? That's foreshadowing. Crazy Woman didn't take the hint, and actually walked into the road next to her truck (just a half-step and one twist of the ignition away from making my life easier!) and aggressively waved me onward, offering a supposedly generous but unsmiling "You can make it" as I craned my neck forward, practically pressing my forehead against the windshield. Only one unfortunate screechy false start later, I managed to thread my way gingerly through the needle. Without even cursing under my breath! Or above my breath, for that matter. Curse-free maneuvering. And then the greatest thing happened: A school bus came motoring down the hill toward the truck jam. No amount of gesticulating would solve that little vehicular conundrum. As I chugged up the hill leading out of the neighborhood, I saw the woman get into her truck. aaaaaah i can't stand inconsiderate drivers!!! i've become a bit vocal when i encounter someone like that...but they don't hear me since i'm in my car. ha. i hope nanny is doing better. I'm very impressed indeed with the forshadowing. stephanie—Nanny is doing swimmingly, thanks. And maybe you should start driving around with the windows down. Of course in your climate you'd probably not be able to drive once you'd suited up for the window-down excursion. Dan—If I can impress you, then my job is done. I'm still chuckling over the fact that you had to take your son to Nana's house to get his diaper changed.